The SPATIAL project defines and builds the cooperation framework for harnessing the territorial capital in order to facilitate competitiveness and innovation for the entire border area. The objective of this project was to harmonize the economic, social, cultural and environmental policies of the entire border region, thus helping to increase the economic competitiveness and to strengthen the territorial, economic and social unity. The main role of this project is to underpin the decisions of the public policies impacting the border area and the investment priorities via public funding. The short-, medium- and long-term evolution of the border area derives from the territorial development strategy that sets the specific objectives, programmes, policies and action plans for the following sectoral domains: economic, social, cultural, environmental and infrastructure. The project has been implemented in the period February 2012-August 2015, had a budget of 4.151.147, 26 euro and was financed by the Romania-Bulgaria Cross Border Cooperation Programme 2007-2013. 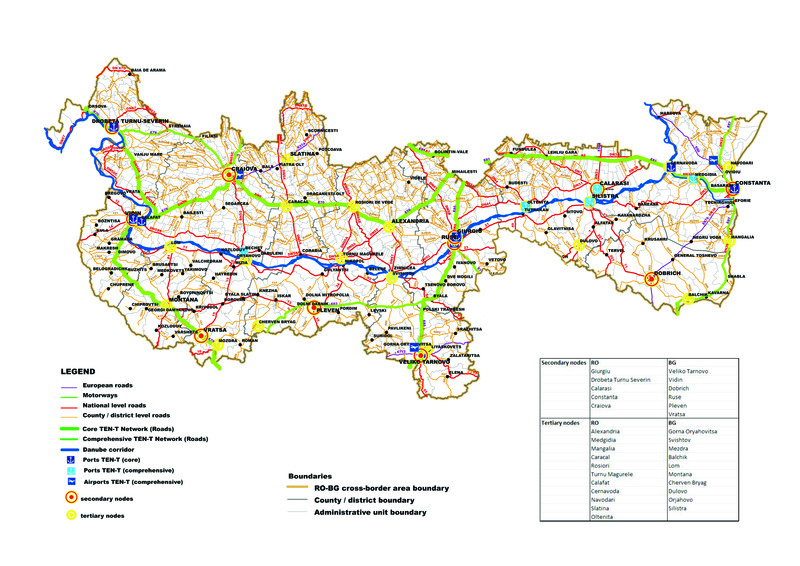 Feasibility study and analysis of the Danube panoramic road. The methodology ensured the framework for the activities realised within the project, mainly as regards to the analysis, data base and strategy. In the strategic planning process, the methodology should ensure the connection between planning and implementation, as well as the mobilisation of the resources required for implementation. At the same time, the methodology ensures the participative character, good information of the stakeholders, the use of a data system that are credible and coherent, and a monitoring and correcting system. Terms of reference for Territorial Impact Assesement Tool. The Romania-Bulgaria cross-border region covers 71.930 Km2 and is inhabited by 5.104 million people. It comprises 16 administrative level NUTS III areas (counties and districts /oblast), that are included in six development regions of level NUTS II....The area is confronted with many challenges from the economic performance point of view, characterised through a very low GDP, lack of accessibility, with pronounced trends of severe demographic decline and insufficient use of resources. 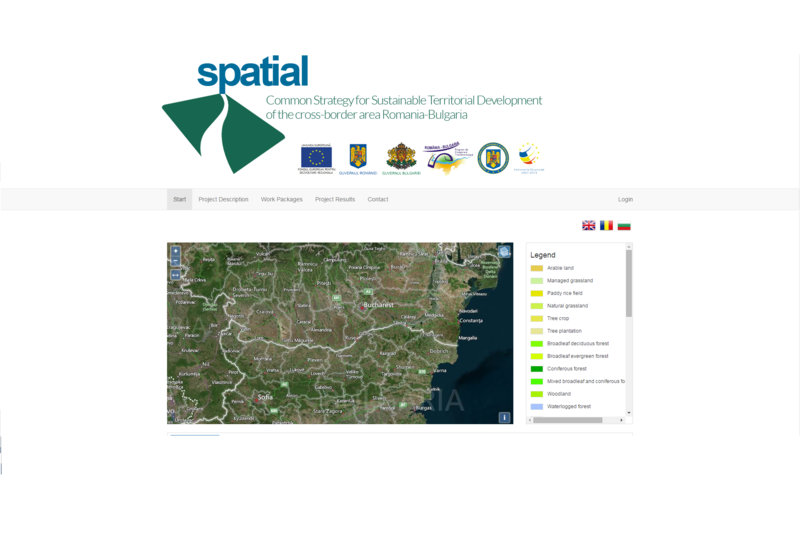 The SPATIAL project offers a joint integrated and strategic approach for the whole Romania-Bulgaria cross-border area and it addresses as a potential functional area; in this way, the project goes beyond the constraints imposed by national boundaries or sectoral approaches. On the basis of the common methodology and in order to prepare the elaboration of the strategy a comprehensive analysis has been elaborated. The rerritorial analysis of the Romania-Bulgaria was developed in two stages, the first consisting of a multi-criteria analysis of all the relevant domains for spatial development of the area, the potential elements and main dysfunctions were identified for each relevant field. In the second stage a general diagnosis has been elaborated, which outlines a prognosis of the future of the border, through three variants of spatial development scenario. 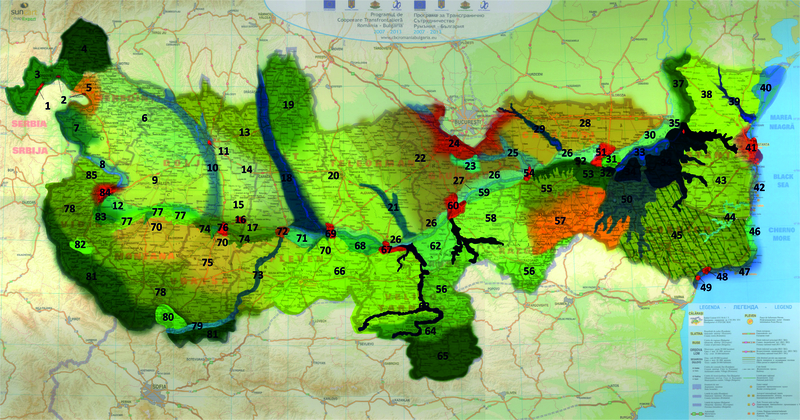 Synthesis of the territorial analysis. The harmonized spatial database on land cover should serve as reference basis for the various sector thematic layers that could be part of the common information resources established for the cross-border area. Through its integration with the existing spatial databaset available in the project region it will constitute the backbone of the spatial data infrastructure (SDI) needed for territorial planning. The produced land cover information will be integrated later into a specific Web GIS portal to allow easy access to the data both for state (local, national administration) and public structures. The elaboration of the reference land cover dataset take into account the abundant information on land cover already captured and stored in various products elaborated in the scope of different pan-European and national initiatives, such as CORINE Land cover (CLC), FAO TCP/BUL/8922 and FAO TCP/ROM/2801. The data sets realised are in accordance with several relevant European acts and initiatives, such as the Danube Strategy, the EU Flood Directive, EU Common Agriculture Policy, etc. The elaboration of reference land cover profit also from the availability of certain input image datasets provided through the Copernicus programme of the European Union and take into account its further operational development for the systematic periodical update of the land cover data. The data model is in compliance with the conceptual framework laid down in the INSPIRE Data Specifications on Land Cover (version 3.0), in order to ensure the necessary interoperability with the spatial information collected at the macro-regional level for Lower Danube, crucial for the efficient conduction of future information for territorial development, risk assessment, land monitoring, emergency response and security. Last but not least, the land cover database ensure the necessary key information required for the calculation of various indicators at NUTS 3, 2 and LAU (local administration unit) levels. The Strategy aims at highlighting and valorising the regional identity, not only by placing emphasis on the common values, but also by stressing the cooperation and exchange between the two states. 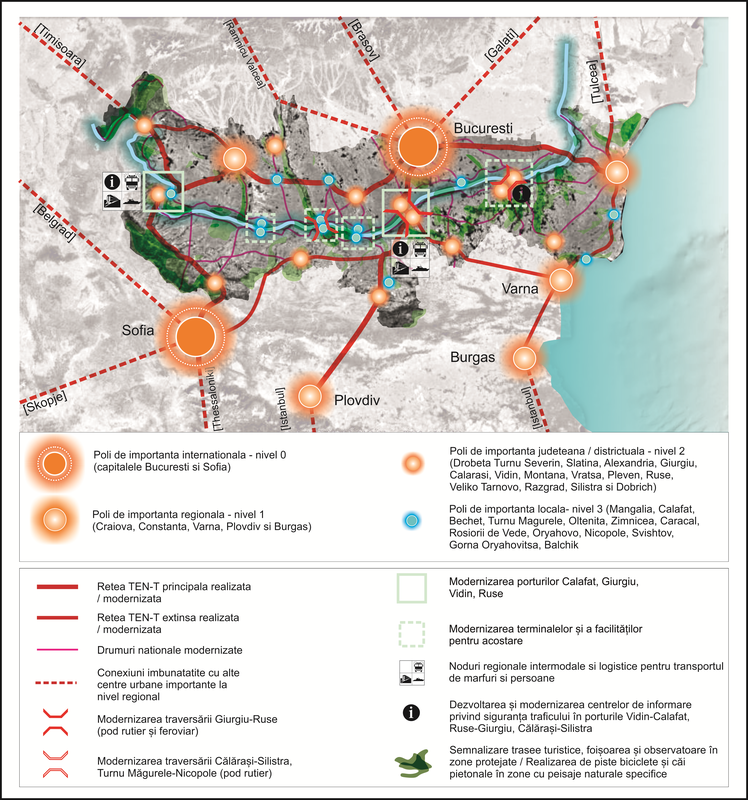 The Strategy provides the vision of an integrated spatial development of the cross-border area, with a focus on the particularities of the area: the peripheral character, the cultural and historical heritage, the environmental aspects and the transport networks. Therefore the strategy approaches the main common priorities, the twin cities on both sides of the Danube as territorial drivers, the role of development corridor of the Danube and the opportunities caused by the vicinity of the Black Sea. The strategy elaborated will be proposed after the closure of the project to the both Governements for analysis and endorsement after all the regulatory and institutional specific requirements will be realised. Report on the strategic environement assesement of the Common Strategy for Sustainable Territoril Development of the Cross-Border Area Romania-Bulgaria. 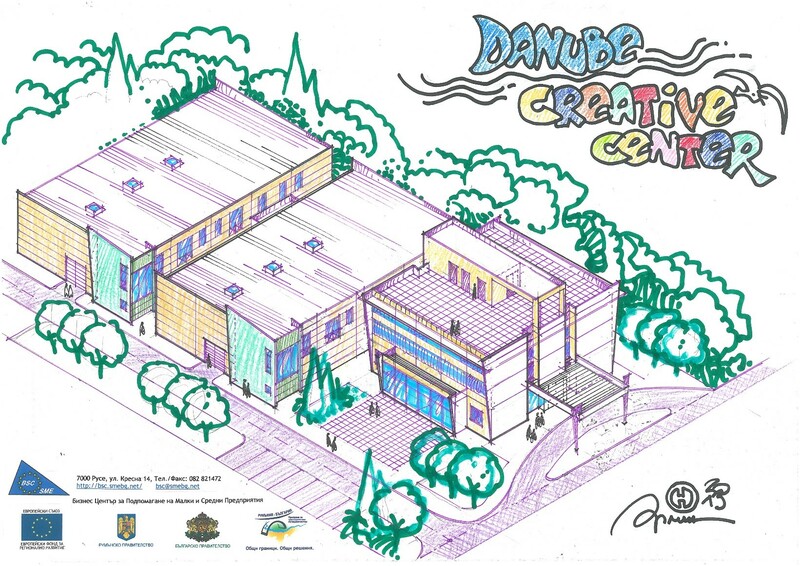 Each pilot project responds to the priorities of the border area, support the preparation of a future strategic project that can be funded during the financial period 2014-2020 and his implementation can contribute to achieving ot the EU2020 and European Union Strategy for the Danube Region. The European Landscape Convention aims to create a framework through transnational and cross border cooperation for the landscapes to become a common European value that could be shared by different cultures and nations....In this respect, the territorial cooperation within the cross border areas can facilitate common approaches between different countries and regions towards a sustainable preservation and valorisation of the landscapes. 100 landscapes units and 30 panoramic viewpoints have been identified and presented in the Atlas, together with recommendations and technical guidelines. Romania – Bulgaria Cross Border Labdscapes Atlas has been elaborated in order to create a common reference framework for the landscapes and to encourage the public authorities from this area and other relevant institutions to take concrete initiatives in better valorising the landscapes. Romania – Bulgaria Cross Border Labdscapes Atlas.